The method known as Pivot irrigation proves one more time that good investments generate great results. Libya is a country located in North Africa and it’s not exactly known for having ample quantities of fresh water to be used to any extent in agriculture. Bordering the Mediterranean Sea to the north, Libya lies between Egypt to the east, Sudan to the southeast, Chad and Niger to the south, and Algeria and Tunisia to the west. 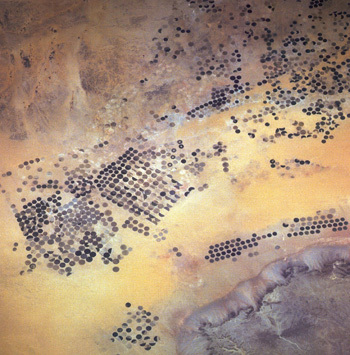 This North African desert country, ruled by a little bit eccentric man, has been involved for years in growing crops by using center-pivot irrigation systems. This system that optimizes energy use, has been designed to minimize water loss through evaporation, by utilizing sprinkler irrigation methods that feed water from a pivot point within a circle. The water being fed to the crops is distributed through pipes that are mounted on wheeled spans which gradually move out from the center of the circle. By using this circular irrigation method, less water is wasted and the crops inside that agricultural circle are able to receive the maximum amount of available water. Although center-pivot machines are used in a wide range of countries, including India and desert regions of the USA, the way how it’s used to grow crops is so unique in Libya. These circular pivot irrigation fields are often photographed by orbiting satellites passing overhead. But Libya is not the only Middle Eastern country trying to “green the desert” through the use of irrigation. Jordan is also practicing pivot irrigation, Israel has been irrigating for years via its patented drip irrigation methods. Even in countries like Syria and other regional countries, including Qatar in the Persian Gulf region which is teaming up with Syria on agriculture projects. 2 responses to "Growing crops in Libya with center-Pivot systems"
I am one of the people that was involved in this kind of project in the 1980’s. We also built very large onion warehouses near Tripoli. We were close to Sabha. I’m interested in more information about this irrigation system as I am planing to start a project in the west of Libya; specialy water amount and pressure requirements. Can anybody help me?